If there's a home base for snow sports in January, it's Aspen for this year's installment of the Winter X Games. And Owners and guests at Dancing Bear Aspen are positioned to enjoy a luxurious headquarters all their own. You're right up close to the most exciting action of the season! And, as announced in the X Games press conference today, January 22, the action sports competition watched by the world will be returning to Aspen every winter till 2019! This week, though, as the athletes spring onto the slopes for their first competition-packed runs on Thursday, January 23, it's time to queue up and make your list of what to watch. Your days will be busy, but you'll have the unique advantage of this haven — our luxury fractional resort — at your disposal. Whether it's a fireside warm-up or a languorous spa and dinner after you take a couple runs yourself, Dancing Bear Aspen is ready for Winter X. Let's have a look at some key highlights of this year's games. For one long weekend, these mountains — already a mecca for skiing, snowboarding, and snowmobiling — become the jump-off for the best in sports and fun. Not to mention the addition, this year, of concerts right next door to Dancing Bear Aspen at Wagner Park (check the next section for what's happening there). But when it comes to the sports, have a look at our picks: your experience of the Winter X Games begins. Wednesday, Jan. 22: SuperPipe Elimination. Everything starts at the men's SuperPipe kickoff at 6:30 p.m. Be sure to look for Noah Bowman, whose stunning silver-medal victory from the ranks of second alternate became the stuff of legends at 2012's competition. Thursday, Jan. 23: Snowboarding! Your next day of events is more SuperPipe action, on snowboards, right up until 7:30 p.m., and then the snowmobiles come out — the freestyle final begins. Friday, Jan. 24: Women's Ski SuperPipe Final. Be sure to stop into the SuperPipe at 5:30 p.m. to see the best of the best women's competition wrap up. Fresh from winning the X Games Tignes as a SuperPipe skier, in 2013, watch for the phenomenal Marie Martinod on the slopes, this time out. Saturday, Jan. 25: Long Jump Final. In terms of pure spectacle, there's maybe nothing more exciting that the snowmobile long jump. Get a good spot to watch the machines take flight, starting at 3 p.m.
Sunday, Jan. 26: Men and Women's Finals. It's a skiers extravaganza of SlopeStyle and SuperPipe finals at 12 noon, 1:30 p.m., and 7:15 p.m. Race after race, you're going to need to catch your breath to handle all of these big finales. Of course, there's a lot more to choose from, and you can find a full schedule of competitions, here. Wagner Park Lineup. Tiësto, a Dutch artist who performed at the opening ceremony of the 2004 Athens Olympics and was voted the greatest DJ of all time by Mixmag, will play the final show of the weekend Sunday, Jan. 26. 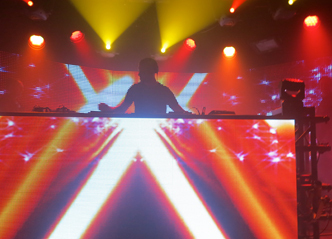 His 5:15 p.m. set will follow a 4 p.m. set by five-time Grammy nominee Axwell, a prolific Swedish dance artist and DJ. You can also find a full schedule of the shows going on, here. And so, this week, the games begin. Join us and be part of the excitement, slope-side, at the stage — and, of course, right here at Dancing Bear Aspen.